The person massages and squeezes the neck. Stress The person feels uncomfortable. This gesture is self-soothing. The largest nerve of the parasympathetic nervous system resides around the stimulated area. This nerve lowers the heart rate when stimulated. 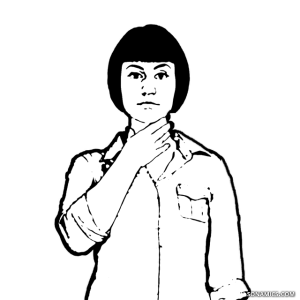 This is one out of 63 gestures from the body language trainer. This entry was posted in face, import, uneasy on 14/08/2015 by Tom Rothe. Hello and welcome to sonamics.com. Our goal is to make you more aware of body language. Please enjoy the info - concise and free. If you like what you see, buy our app Or hire us.